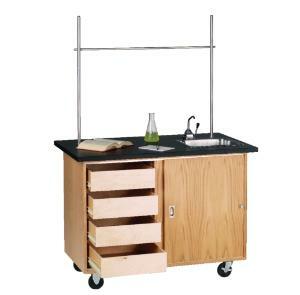 This completely self-contained demonstration center has its own water supply, waste container, stainless steel sink with hand pump, two 3/4" diameter upright rods, one 1/2" diameter crossbar and clamps. Heavy-duty 4" ball-bearing swivel casters with brakes make this unit easily to maneuver. 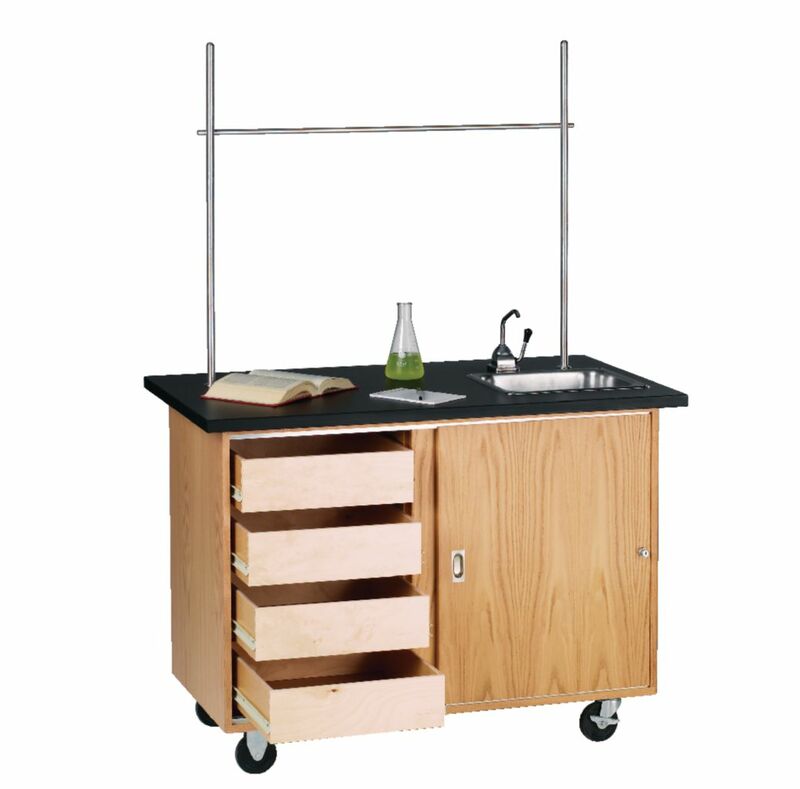 The center features four drawers for storing various lab supplies, which are mounted on epoxy-coated nylon bearing glides for smooth operation. Sliding doors with a lock conceal the drawers, a storage compartment for large equipment, and two 2-gallon water bottles (included). A GFI-protected AC duplex electrical outlet is built into the table and can be powered with the included 25' extension cord. The top is 1 1/4" thick Chem Guard™ high-pressure laminate. The table comes with a built-in sink that measures 15"W x 13"L x 5"D, or you can order it without the sink, faucet, rod sockets and upright set. Constructed of oak with a natural finish. Overall dimensions are 48"W x 28"D x 36"H. Shipping weight: 265 lbs. FOB Wisconsin.